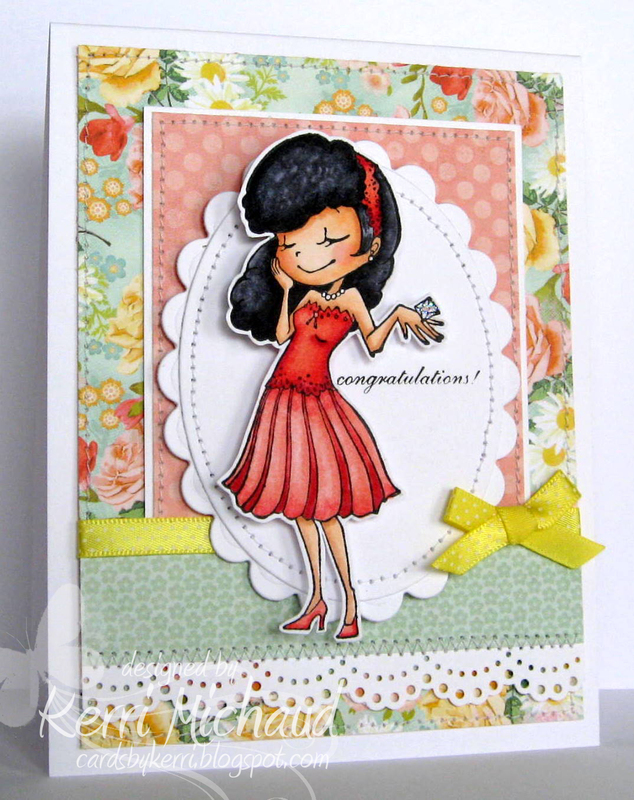 Sparkle Creations Rubber Stamps Preview~Engaged Lucy! How sweet is she, right?! I just adore her! This release is awesome, and we are kicking it off with a preview of Engaged Lucy! I colored her with Copics, cut her out, and paired her with some gorgeous My Mind's Eye Miss Caroline Howdy Doody dp. The sentiment also comes with this image, and I just love the size of it! Be sure to visit all rest of the SCRS designers for more peeks of Engaged Lucy. Sparkle will be giving away Engaged Lucy to one lucky person! For a chance to win, you need to comment on all of the designer's blogs (list below). Then head on over to the SCRS blog and comment on the Lucy post. You have until midnight EST each day to comment. The lucky winner will be announced the following day! Thank you so much for stopping by today! I'll be back tomorrow with another ADORABLE preview:) Have a terrific Thursday! Your coloring is AMAZING on this Kerri! GORGEOUS card! WOW Gorgeous! Great papers to go with this cutie!! OHHH! BEAUTIFUL! I looooooooooove the papers!! LOVE your dress color too! Gorgeous card, Kerri! LOVE your layout and your fab coloring! Very pretty card. I like her as a brunette with the red dress. Fabulous coloring skills. Now THAT is a piece of the rock! :-) What an adorable card and great coloring! Oh wow, this card recreates the moment "he asked the question." I love how you incorporated many colors, espcially my favorite color red.